PPBF: Sloppy Kisses…Self-Esteem and Peer Pressure…What’s the Connection? Hurray! Today is Perfect Picture Book Friday where I link up with Susannah Leonard Hill’s fantastic group of picture book writers, illustrators, librarians and others who contribute a picture book review and related resources for parents, teachers and children. 1. If you haven’t already been to Susanna’s Perfect Picture Book resource page, I encourage you to go. You will find HUNDREDS of picture book titles to choose from…divided into dozens of categories that will make it easy to find ‘JUST THE RIGHT BOOK’! Click on the title and you will be whisked away to the story summary and review…there will almost always be great resource and/or activity suggestions as well. 2. If you haven’t nominated your local library to win one of the 25 FREE copies of Show Me How! Build Your Child’s Self-Esteem Through Reading, Crafting and Cooking that we are donating, PLEASE do so now! Click the book title link above and you will travel to sunny Spain where you can read the most recent review of this must-have resource that makes choosing picture books and planning fun-filled educational self-esteem building activities a snap for parents, teachers and children’s librarians. Help your favorite library win a copy! Just leave a comment on this post or email me at vivian@positiveparentalparticipation.com, naming the library and telling why the people in your community would benefit from having the book available to them. At the end of the month, twenty-five libraries will be chosen using Random.org. Do you tweet on Twitter? Are you a fan of Facebook? Have you pinned anything on Pinterest yet? Are you active on LinkedIn? 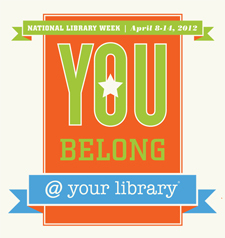 Please help me spread the word about the Show-Me-How Library Project by tweeting, posting and/or pinning. Last week several people re-blogged my post…that’s a great way also! I APPRECIATE YOUR PATIENCE…HERE IS YOUR PERFECT PICTURE BOOK FRIDAY REWARD! Emmy Lou’s family is not ashamed to show how much they love each other. However, when a school friend tells her that kissing is only for babies, Emmy Lou begins to question the way her family shows their love. For several days, the little piglet refuses to allow her father to kiss her goodbye when he drops her off at school and she won’t let her parents kiss her when they say goodnight. Although she doesn’t realize why she is so unhappy, her parents do. When Emmy Lou can’t get to sleep one night, her parents sit and talk with her. How will this problem be resolved? Will Emmy Lou go kiss-less for the rest of her life or will she decide to continue her family tradition and ignore the peer pressure. Peer pressure is a very powerful influence, often with negative consequences. Children can reject it only if they have a very strong sense of self-confidence and the knowledge that they are worthwhile individuals, entitled to say no or disagree with what someone else says they should do. Emmy Lou’s parents respected her temporary wish to refrain from kissing…the respect that they showed her enabled Emmy Lou to believe in herself and make her own decision to ignore her school friend’s advice. Young children need to hear stories like this where the main character triumphs and is able to stand up for what she believes in. The loving relationship is evident in Emmy Lou’s family…her parents paid attention to what she had to say and were respectful of her wishes…up to a point…after all, they ARE the parents. The text and illustrations work well together…keeping the reader and listener anxiously awaiting the problem’s resolution. When our children were young, we enjoyed helping them make things to give as presents instead of buying gifts at the store…a way of saving money while encouraging their creativity. This tradition became so ingrained that even in 1989, when our oldest son was 17, he gave me this card for Valentine’s Day. 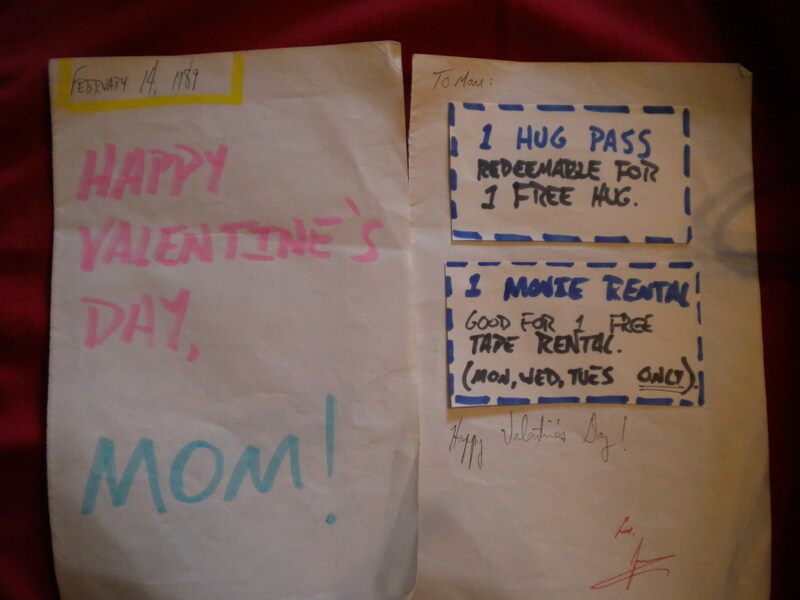 When our daughter was 6 years old, she made her own hugs and kisses coupon book as a gift for her father for his birthday. He still has that as well. Here is a lovely craft activity to do after reading Sloppy Kisses. Young children need hugs and kisses from those they love on a daily basis…how about making a “hugs and kisses” coupon book so that your child can get extra ones as needed. When your children come to you with a hug or kiss certificate, you will have a great opportunity to talk with them…maybe they had a bad day at school, perhaps they are worried about an upcoming assignment…or maybe they just need a little reassurance and demonstration of your love. You will need: Construction paper, markers or crayons, stapler, scissors. 1. Use one piece of construction paper for the cover…cut it if you wish and fold it in half. 2. Your child can decorate the cover. 3. Cut another sheet of construction paper (or copy paper) into coupon-size certificates. 4. Write the words: Good for 1 Kiss and Good for 1 Hug on them. 5. Let your child decorate each coupon. 6. Staple the coupons into the cover. I’ve been making these coupon books and gift certificates for over 40 years, but now everyone’s doing it. Family Crafts has a wonderful assortment of printable coupon ideas here. Cricket Magazine has a board book set called Mommy Hugs and Daddy Kisses here. 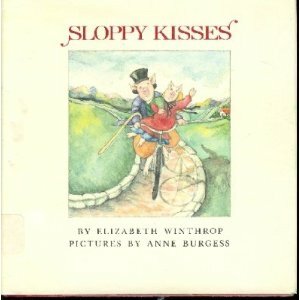 The Bennington Free Library has a story page with activities for Sloppy Kisses here. Parents Magazine has a page of instructions for making coupon books here. Nick Jr. has some printable hug coupons here. This entry was posted in children's picture books, Crafting with Children, libraries, peer pressure, Perfect Picture Book Friday, Reading with Children, self-esteem, Show-Me-How Library Project by viviankirkfield. Bookmark the permalink. This seems like a good book! The illustrations look funny! I would like to hear what happens! I did a certificate book for Valentines Day for my Mom and Dad in school. Thank you, Erik…so glad you liked the book and the activity! I’m sure your mom and dad LOVED your certificate book. 🙂 What were the certificates good for? Chores or hugs and kisses or something else? Thank you for sharing those, Erik! They are all wonderful ideas for certificates/coupons. 🙂 Do you like to cook? Breakfast has always been my favorite meal to cook also…kind of brunch, I guess…pancakes or french toast or omlettes or scrambled eggs & bacon…now I’ve made myself hungry. 🙂 I even like to make breakfast for dinner if it is late or I want to eat lightly. Yes, you are so right! I think one of the collateral benefits of parents reading picture books with their kids is that many of the messages can help the parents in their own journey through life. 🙂 I’m so happy to have your comments! You are so welcome, Jennifer! Parenting is such a difficult job…but being a child is even harder…I know I wouldn’t want to go through childhood and adolescence again…peer pressure challenges both parent and child. I think books like this one combined with a positive self-image and a strong parent-child connection can help a child stand strong. Methinks they will LOVE the coupon books!!! Thanks, Julie, glad you liked the choice and the activity…it is a sweet book and the activity can be used for so many different helidays and occasions. Sounds like a great book. My five year old has this issue going on right now. That is a great thing to teach kids and perhaps parents, great choice! So glad you liked the book and activity, Susanna! I really do look forward to PPBF…it is a joy to participate in this amazing group! Love this choice. So many lessons here for a child and parents. Kids do reach that stage where they would rather be dead than be embarrassed infront of their peirs. Nice way to work out a solution. Again, wonderful activities! Did you see the message I left two days ago on your other post. I walked into my library, and as I passed the Parenting section, there was your book displayed for all to see. So I snatched it to read! They already had your book! Hurray!!! Thank you so much for telling me..yes I did see your message and I think I answered it…but how any of us can keep it all straight is beyond me. 🙂 That is such a thrill for me…I do appreciate you passing that along to me…I know the book is in a couple dozen libraries across the country…but don’t know which ones. Which library do you go to? Washington Centerville Public Library in Centerville, OH, which is a suburb of Dayton, OH. I was the one pleasantly surprised. Love the hugs and kisses coupon book! What a great message, not just about kissing, of course! Everyone should check out this website…the book reviewed is an oldie-but-goodie…originally published in 1929! What a wonderful book, Vivian. I have to admit, I come from a very huggy/kissy family, and I treat my boys the same way. I give my preschooler a kiss every day I drop him off at school, and I’m just waiting for the day when I get push back because his friends think it’s weird. Kirsten…it’s interesting…kids are so very unique…and I think it has more to do with who they are then how we parented them. I have two sons and a daughter…and although they have some similarities, they are very different from each other. My younger son (now 36) is extremely demonstrative in showing his affection…and when he comes to visit and we all go out to eat, he will put one arm around me and one around his wonderful wife as we walk down the street. My older son is much more reserved. And my daughter and I have always been very close. I hope so, Vivian. They are both pretty snuggly now. As you can see, Patricia was next on my “too reply list.” Argh. Fingers typing too fast and the brain can’t keep up! Thank you so much for stopping by, Fatima. 🙂 Glad you liked the book and activity…peer pressure is such an important issue with kids (and adults)…hope this book is helpful. If I had kids of my own I would love to have used this just to sneak in the extra hugs….lol. Here is why I think My Library, Rust library needs a Show Me How book as donated by you. This library has a good endowment keeping it going and it could buy your book if it were so inclined but the books they have and the parents they appeal to are all in need of your book. They have the books stated in Show Me How, that is not the problem. In fact they have no problem. Like i said they are financially secure. And they would benefit from your book tremendously because they could steer a needy mother to the book and she would get the advice she needs at the moment and make her day with her little kids easier. Clar…thank you so much for nominating Rust Library to win one of the copies of Show Me How! I love your comment. 🙂 I am excited for more libraries to have the book because then it is shared by so many. Who wouldn’t want to read a book called sloppy kisses? 😉 I’ll have to check if my library carries it. So far, I can’t complain about this problem with my boys but I know one day they may not want the kiss in public situation. For now, every morning my little guy and I bring his older brother to school and we hug and kiss while in line and waiting for the bell. We even have a “group hug” every morning. And my boys oten hug each other, even when we’re out and about in public. Brotherly love is quite special! I once read something very interesting in book on child development. Children crave physical contact, and they don’t stop as they grow up. So if you stop hugging your child as he turns a teen, he will want to find hugging somewhere else. And this explains why so many kids have “girlfriends/boyfriends” so early on, because they crave the physical contact they should be getting. So a few hugs a day can really make your children feel great, in many ways. Seriously, I know that you are 100% correct…I plan to do a post about this soon…I will quote you, if that is ok…and put a link back to your blog. Haha, you give me too much credit! And I wish I could remember that book title, but I don’t. The thing is, there are a number of studies out there about hugging children (and teenagers), which makes them more loving and caring, and less aggressive and promiscuous. Even if teenagers may not want to be hugged or kissed in public, they will still want it in the privacy of their home, especially if they have been used to it their whole lives. And what’s even more interesting is the U.S. is one of the countries that displays the least amount of touch between parents and their kids, which partly explains why this culture is more aggressive violent than others (you can’t just blame the video games!). Yes, Milka, you are spot on again. 🙂 I think many parents don’t even realize that for many of them, they give their children attention when they are doing something “wrong”. And, in addition, the great majority of the “touching” that goes on is a push or smack when they misbehave. A cold or disapproving look is equal to negative touching as well, I think. How about some warm fuzzies instead. 🙂 Have a great week! 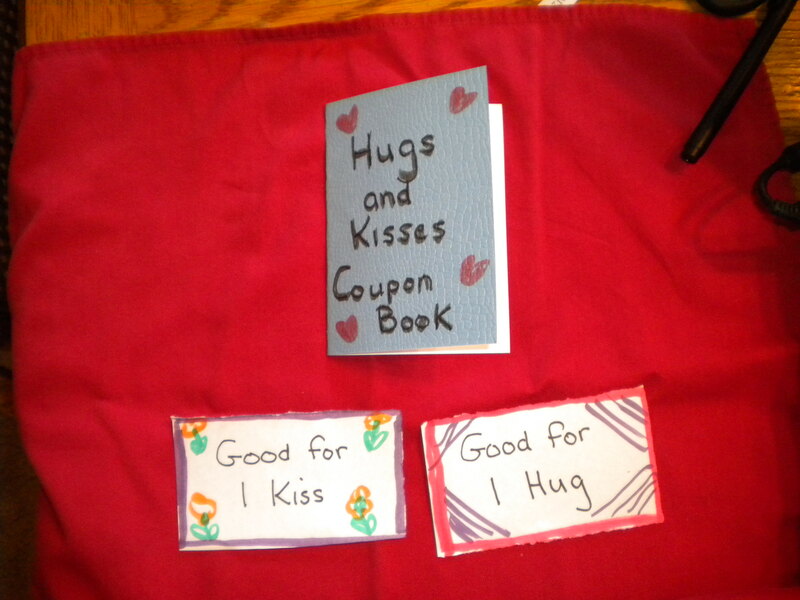 I love the idea of the hugs & kisses coupon book! Thanks!